Sadie was quite excited when I brought up her ballet bar and dance mat and told her we were going to watch some dancing. She put her tutu on and I popped in the Prima Princessa Presents Swan Lake DVD. She was mesmerized with the ballerinas dancing. She hasn’t really watched any ballet before unless you count Angelina Ballerina whom she loves. Although she didn’t really participate in all the steps demonstrated by the school of American Ballet students she watched every move they made and especially liked watching the Prima Princessa Ballerinas as they were more her age group. 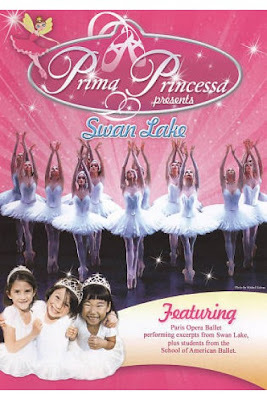 Prima Princessa features the Paris Opera Ballet who perform excerpts from Swan Lake, narrated by Prima Princessa herself! Running time is Approx. 40 min. Check them out at www.primaprincessa.com Your little ballerina will be dancing away in no time. The DVD will be re-released on March 2 2010 and will become available on Amazon.com and Target as well as other stores across the country.